November 2, 2013 February 27, 2014 filipinocavedivers Cool Stuff! Few underwater caves have been discovered in the Philippines. In the world of cave diving, a discovery remains a secret for the pride and pleasure of the pioneering cave diver who first ventured inside a new underwater cave. Only recently when local cave divers pooled resources and information together to form the group Filipino Cave Divers that they started to explore new caves at an exhilarating pace. In a span of two years, new extensive underwater cave systems such as Bababu Lake in Dinagat Islands and Hinatuan Enchanted River Cave in Surigao del Sur were explored and mapped. Another underwater cave was recently discovered in Surigao del Sur. Pamutuanan Cave, 8.566563°N, 126.112105°E, located in Lianga, Surigao del Sur, was already identified by the DENR as an ordinary cave system. In fact Pamuntuanan Cave is listed in the DENR’s Cave Handbook. Last October 2013, TDI cave divers Jake Miranda FCD and Ivar Almjhell (Norway) ventured deep into Pamuntuanan Cave and found more than 450 meters of new passageway. The first one hundred fifty meters was an open but partially flooded chamber. Imagine swimming in a river with a limestone roof over your head. The next 300 meters consisted of an underwater swim. This cave is not particularly deep like other submerged caves. So far, Pamuntuanan has an average depth of 3 meters, and the deepest reached by divers was 6 meters. It has air pockets throughout the 450 meters of explored space, but air pockets get less frequent going further into the cave. This is a dripstone and dissolution cave with fractures, looking like Swiss-Cheese as one goes farther and deeper. Freshwater is always flowing at slow to medium flow (during our dive, a week had past with no rain). The cave’s outlet is still the sea. But sea water comes in the entrance during high tide and seeps in to about 200 meters. For cave diving instructors and students, this is a great training cave for the first 150 meters. After, it gets interesting with sidemount. It gets more interesting to look above water and see medium-sized chambers with stalactites. For cave divers, sidemount configuration with two tanks is recommended. 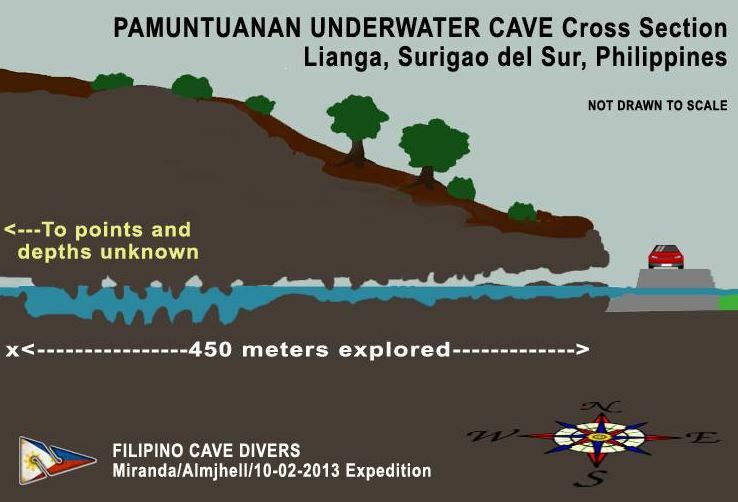 There is a major expedition to be conducted on Pamuntuanan by the Filipino Cave Divers to be led by Dr. Alfonso “Docboy” Amores this November 2013. Joining this expedition will be Alex Santos, who is regarded as the cave and technical pioneer of the Philippines. Alex Santos was also the first one to dive Hinatuan Enchanted River back in 1999. Joining this expedition will be a representative from the Department of environment and Natural Resources Caraga Office. The results of this expedition will be formally presented to Protected Areas Wildlife Bureau Chief Director Mundita Lim, during the National Cave Committee meeting come November 19, 2013, in Manila. PAWB is the government agency that regulates access to all the caves in the country. It is also mandated to provide protection, and conserve these natural resources. As Pamuntuanan’s direction goes west northwest on the map, it may finally lead towards a limestone plateau 5 to 7 kilometers away. The locals want to know how far it goes. This can be a record-breaker of sorts. During a subsequent dive by TDI cave diver Ivar Almjhell, he found the spring with a strong flow at the end of 450 meters. This cave can also be deeper than previously thought of. The Office of Governor Johnny Pimentel, Surigao del Sur, has committed to support the upcoming FCD expedition. Pamuntuanan will just be one of probably three or four cave systems to be mapped during this trip. The FCD team would like to thank Mayor Sarmen of Lianga, SDS. We would also like to thank SDS Provincial Tourism Officer Nick Sonsona and Lianga Tourism Officer Glen Sanchez.